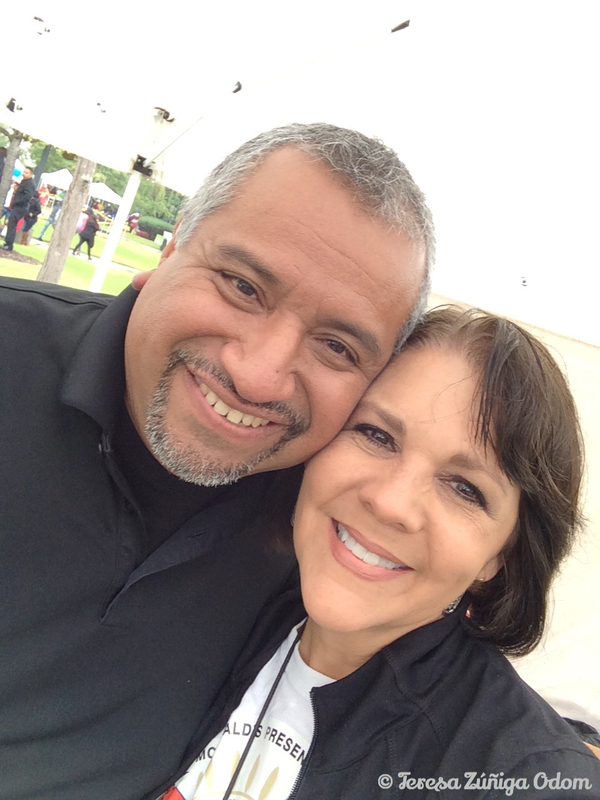 Fiesta 2015 Rain or Shine! This was the crowd during the last two acts of the night…incredible! Despite the cold! 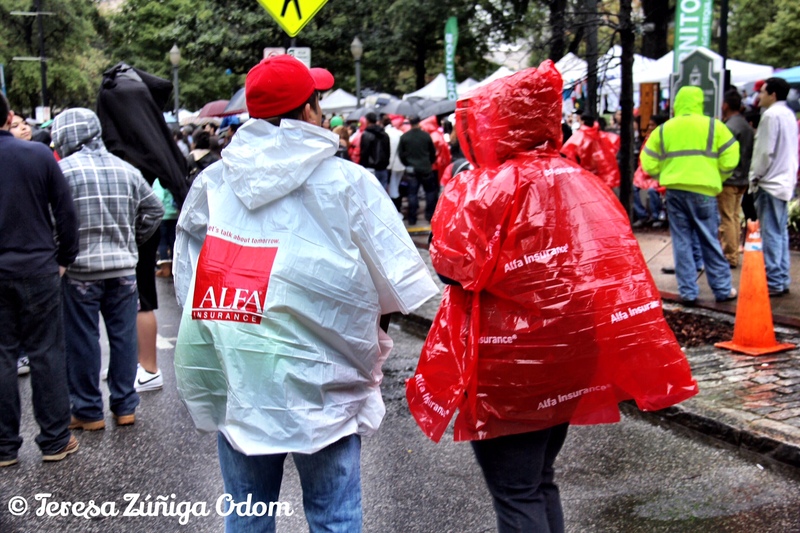 Two Fiesta patrons in rain gear on their way to the Coca Cola Music Stage. When you have an outdoor festival, you have to expect the weather will catch up with you at some point. So for Fiesta’s 13th year, it did. 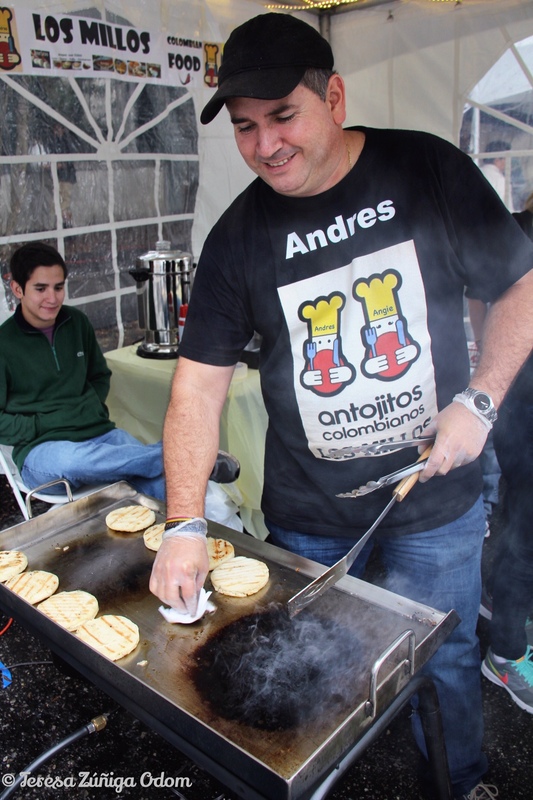 We thought the rain would stop by noon – that’s when Fiesta “officially” opens, so we were hopeful. Then the forecast changed to 1 p.m. – and if you were there, you know that didn’t happen. I think we were just on the wrong side of the road when it came to the rain. Thankfully, it wasn’t a downpour. And thankfully, people came out and simply put on hats, rain ponchos or just didn’t care about getting wet. Incredibly, as the day went on, and the drizzle came and went, people kept coming and enjoying the villages and especially the music. All in all, I would have to say this was one of our best years! 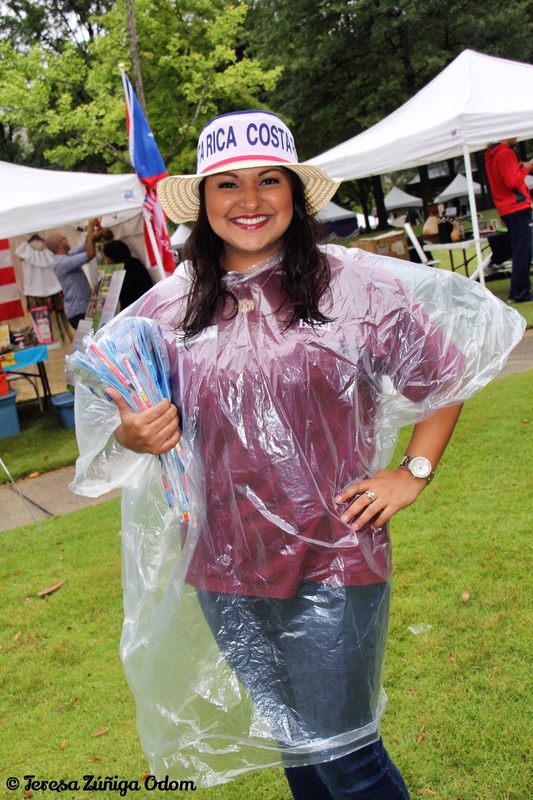 Veronica Richey with BB&T Bank threw on a rain poncho and got to work at her booth at Fiesta wearing a Costa Rica hat! 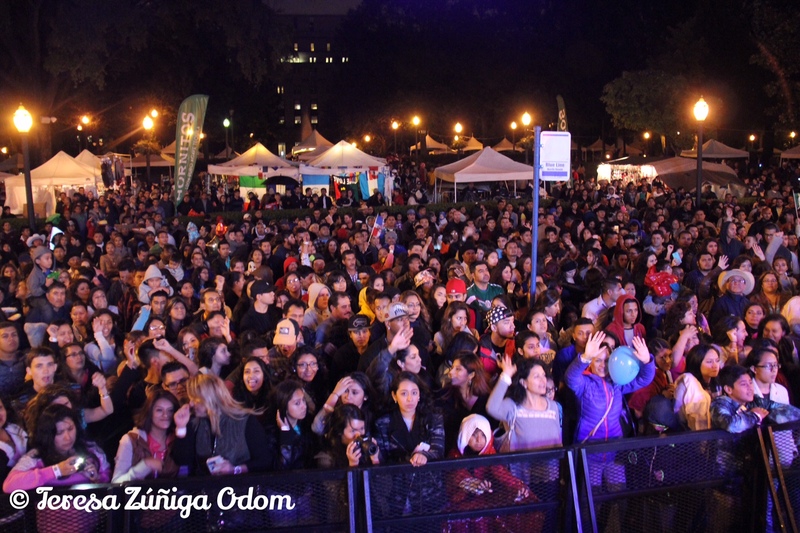 This year’s Fiesta showed us that people love this event and want to be here no matter what. It also proved to be one of the most diverse crowds I believe we have ever had. This absolutely thrilled us. This event matters to the Hispanic community and also to the community at large and this was proven with the numbers we saw all day long. About 10,000 people made it to Fiesta this year! Personally, I had the best time once I stopped worrying about my soggy hair. Thank goodness for hair pins! As I walked through the park and strolled down the Cultural Village with my camera, I grew a little concerned for the Cultural Village. 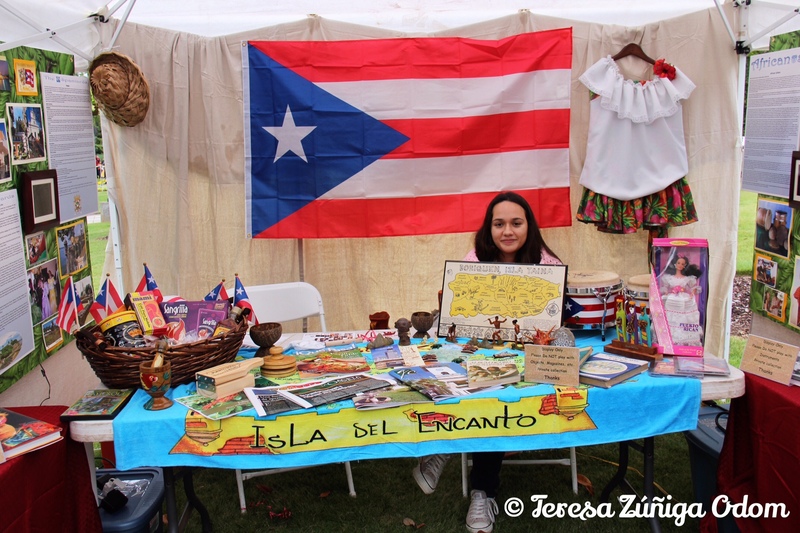 Each year these wonderful members of our Hispanic community bring their own personal artifacts and treasures to share with the Fiesta patrons. The tents helped keep things dry and the rain didn’t seem to affect those who were there. They just adjusted and pulled the crowds in to share their country stories. Los Millos booth at the Food Village – this was early in the day as the food vendors began preparing food for the day. This is where I got the delicious empanadas from Jairo and Lucero Vargas! So, right after my friends and Latino News owners, Jairo and Lucero Vargas treated me to empanadas at the Colombian food vendor – Los Millos, I walked through the village and visited my friend Miguel Vilchez who pulled the Peru booth together. 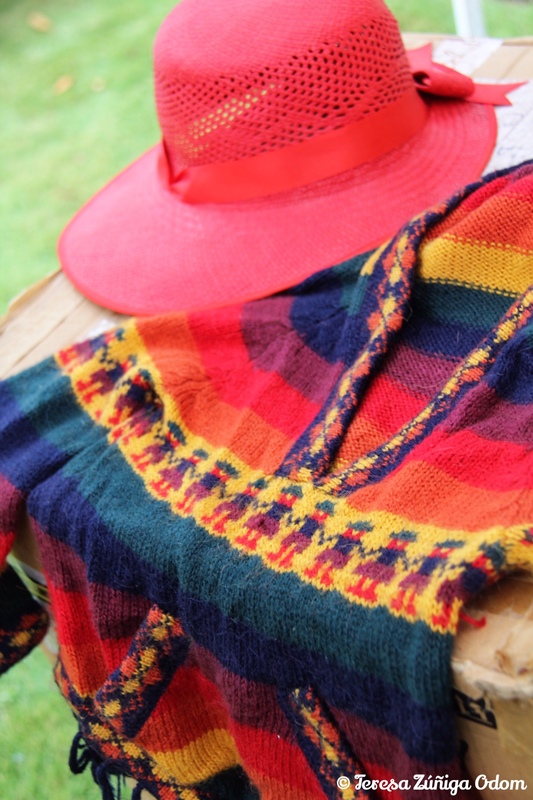 He gave me a red Peruvian hat to wear to take care of my hair later that day – even though he said my hair looked fine – he’s such a gentleman! Across from Peru was the Mexico booth. 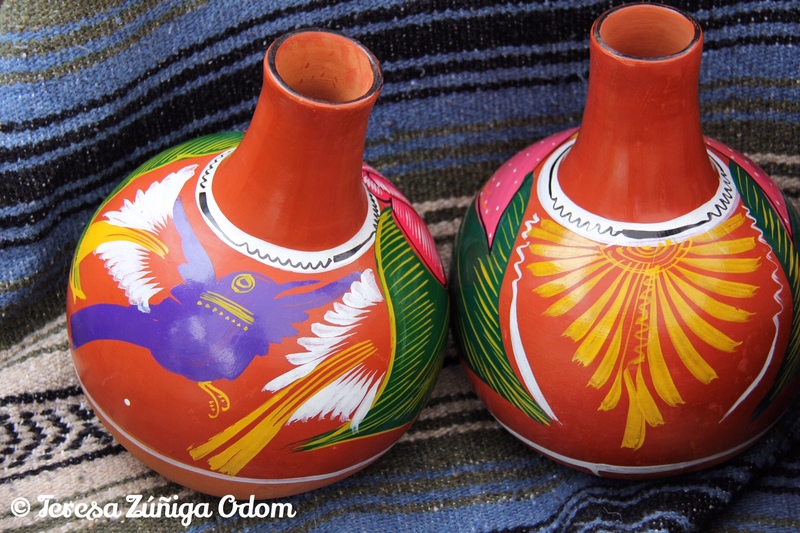 Maria and Luis had pulled together two booths of beautiful Mexican art and pottery. It was so colorful! They gave me a Jarrito jug as a gift which is simply beautiful and then poured me a tequila shot and we took selfies. Next I went to take photos of the Cuba booth where they gave me some Cuban coffee…OMGEEEE! That was so wonderful and after the tequila, it REALLY warmed me up. When I tell you how awesome the Cultural Village is, you need to believe me! Because of the weather, we all huddled closer together under each tent as we made our way through the village and vendors stationed throughout. It was such a great feeling of friendship and belonging. It’s the type of feeling I want everyone to experience at Fiesta. Me and Miguel at the Peru booth. Jarrito jars at the Mexico booth. This is the type of clay jar that Maria and Luis gave to me at Fiesta. So beautiful!!! 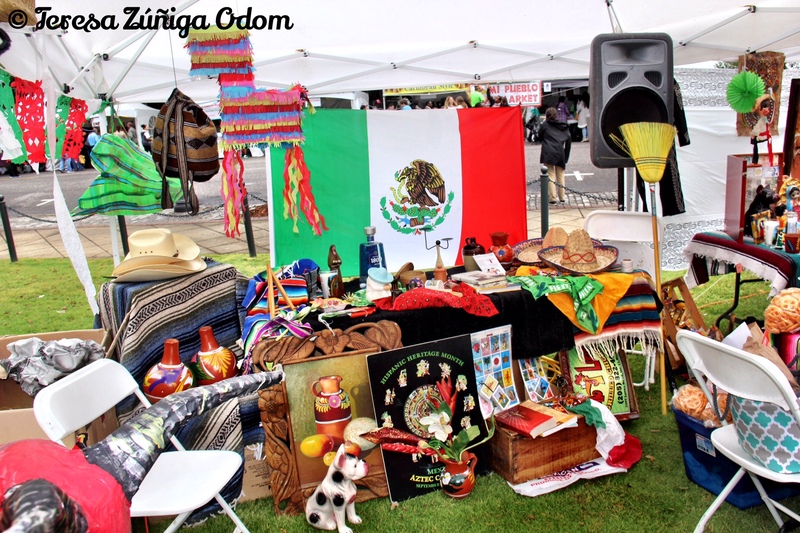 Some of the beautiful items displayed at the Mexico booth! 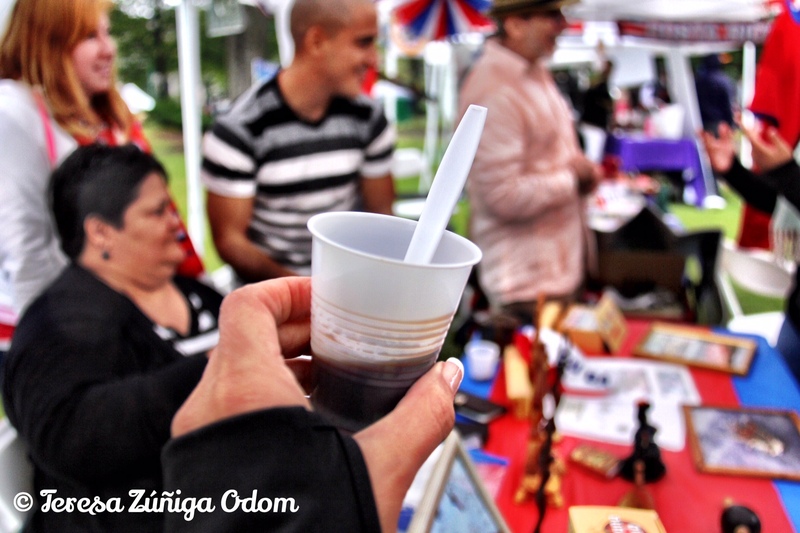 Believe it or not…this little cup of Cuban coffee did wonders for the chill I was experiencing at Fiesta! Packed a punch! 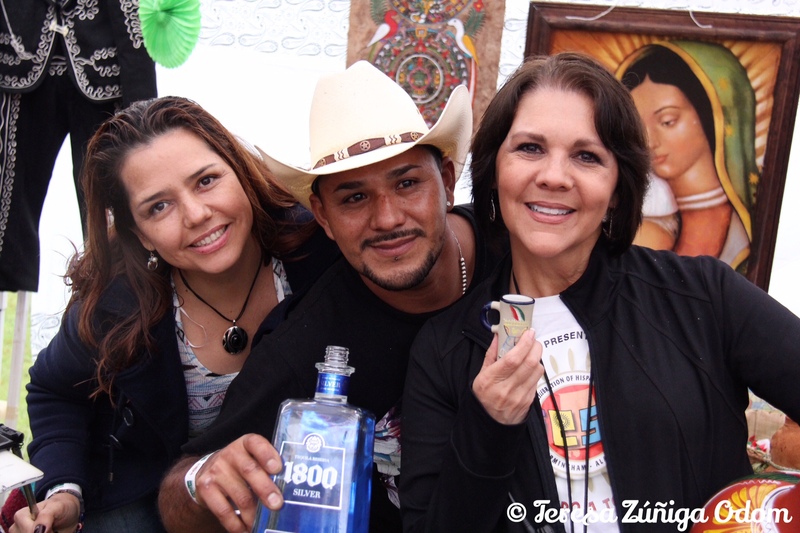 With Maria and Luis at the Mexico booth toasting to a wonderful event with a tequila shot! Salud! A few items from the Peru booth – Miguel gave me the red hat to wear as he packed up his booth to leave…sure did help hide my soggy hair! 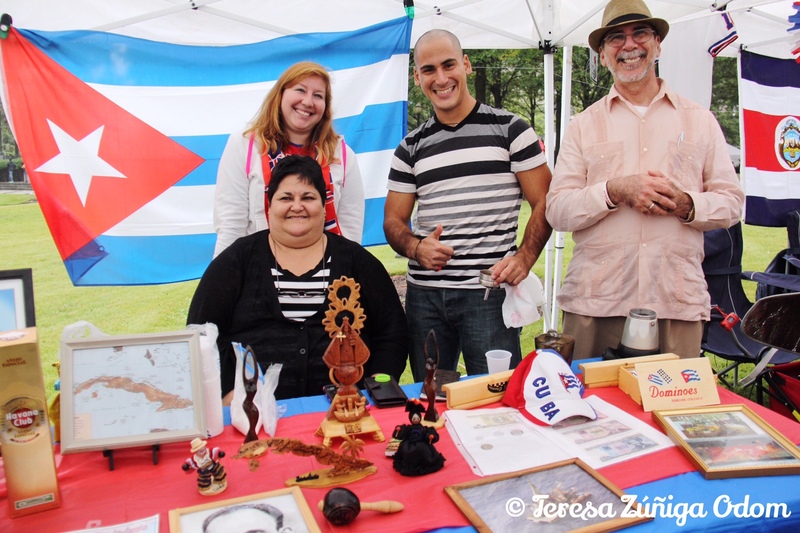 This entry was posted in Birmingham, Cultural Village, Festival, Fiesta, Hispanic, Hispanic Heritage Month, Hispanic Resources, Linn Park, Photography and tagged Colombia, Costa Rica, Cuba, Cuban Coffee, Cultural Village, Culture, Festival, Fiesta 2015, Jarrito Jars, Latino News, Los Millos Restaurant, Mexico, Peru, Puerto Rico on October 5, 2015 by Southern Señora.